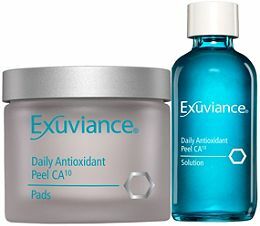 Exuviance’s Daily Antioxidant Peel. It is a one step, leave on, daily, antioxidant peel. Made up of 10% citric acid- to neutralize free radicals, help prevent signs of aging, and exfoliate. In just a few uses you will notice smoother texture, and a more even tone in your skin. So swipe this pad on daily, and get that glow..